Originally built in 1790 and restored in 1999, the building represents the most impressive example of baroque architecture in El Puerto de Santa María. Locally the building is known as the Casa de los Leones – the House of Lions – as these fine beasts decorate the pillars of the entrance. Although the entire façade is very pleasing to the eye, the undulating balcony is of exceptional merit, with its design and wrought iron serving to intensify the baroque appeal of this unique building. Also worthy of mention is the statue of the Virgen de la Escalada - Virgen of the Climb – in her oratory flanked by 2 pillars. 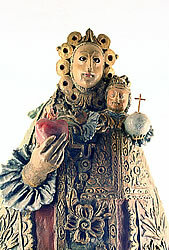 The virgin is comes from the mountains and is crafted in gilded ceramic and dates from the XVII century. Other important features of the construction are the main interior patio and the galleries that surround it, whose wooden beams, balusters and wrought iron have been fully restored. Adjacent to the house lies the Plaza del Mercado – Market Square – built in 1874.